For Susheel Busi, a doctoral candidate in Molecular Microbiology and Immunology, making the decision to pursue his graduate education at MU was one of the easiest choices to advance his research interests in understanding the role of the complex gut microbiome and biofilms in a rat model of human colon cancer. But what Busi never anticipated was presenting his dissertation and winning 2nd place at the Conference of Southern Graduate Schools Regional 3MT competition. “What started out as a challenge to myself: can I present my thesis in 3 minutes, ended up with me not only winning the 2nd place at the Conference of Southern Graduate Schools Regional 3MT competition, but more importantly, offered me the chance to meet and interact with a lot of students and graduate school officials,” says Busi. Today, Busi credits the ongoing research about how commensal gut bacteria affect diseases such as inflammatory bowel disease and colon cancer, as one of the reasons why it was an easy choice to study at MU a decision that continue to pay off. Busi explains that he has been fortunate to be exposed to a myriad of opportunities here at MU that have made his journey and growth significant. “Starting from my first year, the inter-disciplinary programs such as MPT and the possibility to interact with people from the Medical and Veterinary Schools was enlightening to say the least. An array of platforms such as the CVM Research Day, the Health Sciences Day or Life Sciences Week or the Research and Creative Activities Forum have afforded me the option of interacting and collaborating with people across the campus,” explains Busi. “That was the first sign that I was in good hands, because my primary response to everything is usually skepticism. I’ve always found him to be a very enthusiastic researcher, who instills an ideology of perseverance. When I first joined the program, I remember having a conversation about the research direction of his lab. He said that the direction would be established by his students, and that he would guide us along the way,” says Busi. 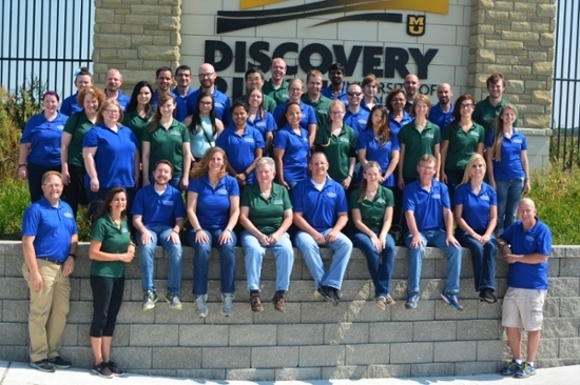 Susheel Busi is shown above alongside the faculty, staff and students at Discovery Ridge whom he credits for their encouragement and support. As a result, Busi acknowledges Dr. Amos-Landgraf with a great life lesson that he continues to carry with him. “It’s a teaching moment! You can use it to teach people,” is what Busi says Dr. Amos-Landgraf would proclaim many a time. “Every time I have to present or speak in front of an audience or even if I’m networking at conferences and meetings, the words, “It’s a teaching moment!” reverberate in my head. That makes a lot of difference in how I now approach and interact with peers and other mentors even,” Busy explains. 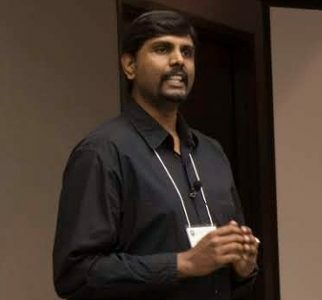 And it is with this same teaching approach that Busi would like to eventually use to pursue his long-term goals of becoming a professor in India or other developing countries. “My way of serving the community would be to develop the next generation of students to collaborate and interact with each other across the world. I would love to teach students an enthusiasm for research and the idea of curiosity through my endeavours,” Busi shares. Busi wishes to acknowledge everyone in the Comparative Medicine Program, the Comparative Metagenomics Lab and all the faculty at Discovery Ridge, the MPT program, the School of Veterinary Medicine and the Graduate School for their encouragement and support.